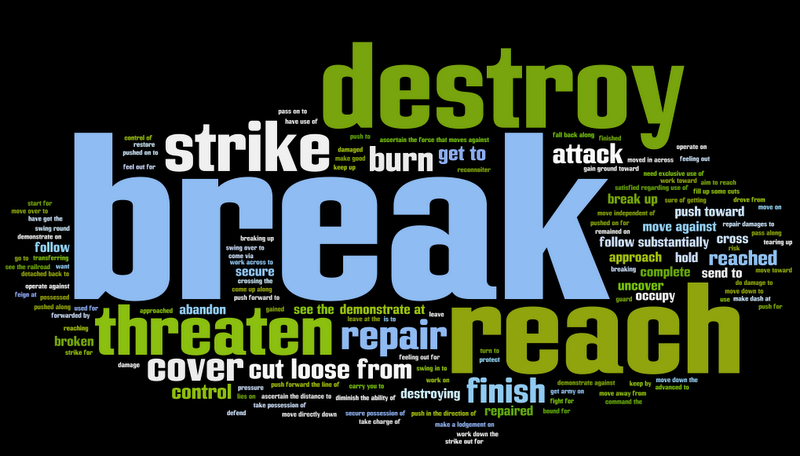 Word Cloud of Official Correspondence of William T. Sherman during the Atlanta Campaign from Railroads and the Making of America. I received a notice that the Yale University Press has published a new book called "The Iron Way: Railroads, the Civil War and the Making of Modern America" by Professor William Thomas. I will review the book after I get a chance to read it. In the mean time, Professor Thomas has put together a companion site at The University of Nebraska called Railroads and the Making of Modern America that is worth a look. The University of Nebraska site has a great collection of data, maps, letters, photos and articles on the role railroads played in U.S. history from the earliest inception of railroads to the post civil war development. It has several interesting animated graphics that exploit the dynamic attributes of on-line presentations compared to static print. For example you can watch the progress of the railroad construction in Nebraska as a function of time. Some of their conclusions are surprising, especially about the role of the railroad in South's development. 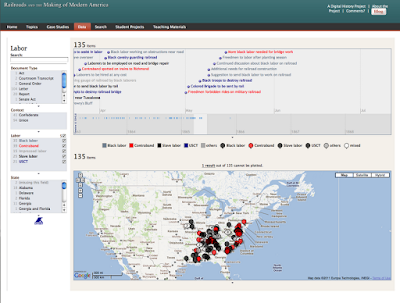 For example the site has a graphic that shows southern railroads at the time of the civil war reached more of their population, as measured by having a railroad within ten miles, than the northern states. They have an excellent topic discussion on the USMRR. They really delved into the labor arrangements for the USMRR construction Corps, which is a subject I had been wondering about too. The timeline and accompanying map found at this page is pretty neat as it logs in time and place. An excellent use of web based graphics display. Some of the graphics do appear to be done just because they can and not for their research value. There are some animated nodal diagrams that didn't convey much new information to me in spite of their animated aspect. But many were downright fascinating. I found the "word clouds" particularly intriguing. Check out this one depicting Official Correspondence of General Sherman during the Atlanta Campaign. It gives you an immediate view into Sherman's state of mind. Professor Thomas' website is well worth checking out if you have any interest in early railroads in America. Seems like I brought home more than just memories from California. I had a mild flu this weekend that curtailed my activities. Four other family members from disparate locations also got sick, so it was something we caught out there. Nonetheless, I was able to begin the terrain forming at Brooke and at the tunnel to Aquia. First, I used my Sawzall all to cut access holes in the plywood table under the ridge. I tested out the holes and all of the hidden track is accessible for maintenance and cleaning. Then I replaced the fascia section near the tunnel to bring the top edge higher, allowing a more natural ridge line near the portal. The higher ridge also helps block the view between the southern end of Brooke and Falmouth. This makes the layout feel bigger because you can't see all the scenes from one location. Next I started adding cardboard webbing to create the ridge line. At the tunnel portal area I used upright pieces of foam to create the basic land shapes. I glued in the tunnel portal after checking clearance with the General, the tallest of my locomotives. I also got my Sherline lathe set up and started making cannon barrels, but I'll cover those in a later post. Almost finished with the webbing. The new fascia piece is visible in the foreground. Reaching the sky board at the ridge top is tricky, but doable with a step-stool. We just got back from a week-long Worthington family mini-reunion in La Jolla, Ca. While there, I had a chance to visit the La Mesa Model Railroad Club located inside the San Diego Model Railroad Museum, in the Casa De Balboa building in Balboa Park, San Diego, California. This is one of my favorite model railroads due to its scope, prototype fidelity and scenery. I made a short video that you can see below. Please enjoy this brief HO scale interlude. We'll get back to O Scale Civil War railroading soon. gray shirt with blue ink only. 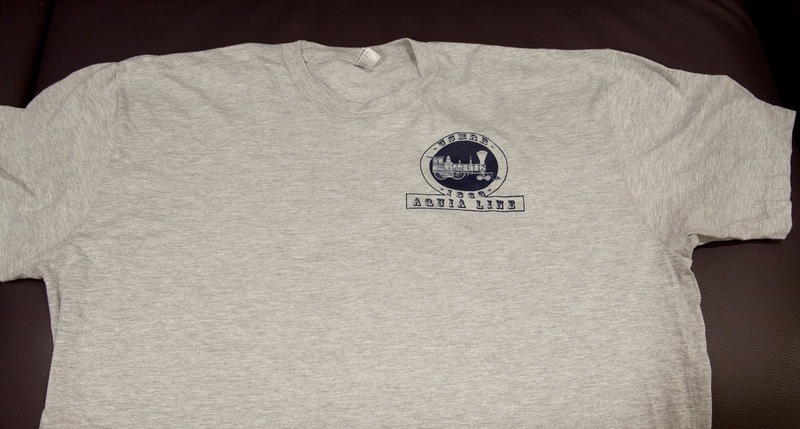 To celebrate the third year of working on the USMRR Aquia Line model railroad and to commemorate the 150th Anniversary of the beanpole and cornstalk bridge, we are offering this custom designed and silk screen printed T Shirt. 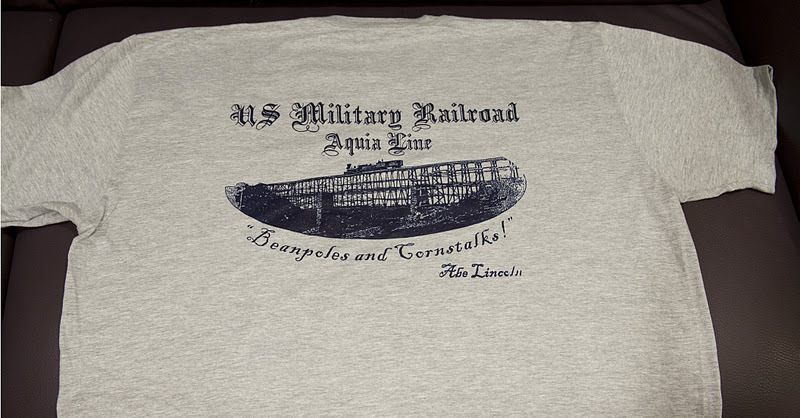 The front depicts a small USMRR Aquia Line logo, while the back depicts the famous beanpole and cornstalk bridge built by Herman Haupt and made famous by Abraham Lincoln's comment. We tried two colors of shirt and decided that the blue ink on the gray shirt carries the detail the best, so that is what we will be offering. It is available in medium, large, extra large and 2 extra large sizes. If you need a different size contact me and we'll see if it is possible. The shirts are 100 percent cotton from American Apparel. They will shrink a little. I am a 42 inch chest and wear a large, which is what I am modeling in the photo. The cost is $15.00 plus shipping. You can order from our Alkem Scale Models website here. Out town visitors was the final motivation I needed to finish up reorganizing the post-flood disorder. I got most everything put away, and cleaned the track to get ready for a visit by Scott Mason and his colleagues. They were in town for a custom layout project. I figured they would want to run something, so I fired up the DCC system. Oops, trouble. The McCallum headlight was flashing. A quick check on the Tsunami AT-1000 manual indicated that 10 flashes means voltage overload. I checked the power supply and sure enough, the variable voltage switch was maxed out. It must have been jostled during the flood chaos. Setting it to 18 volts solved the problem. A test run showed all systems go. The McCallum was running nicely. Scott, Dan Wickenheiser and Dave Vago showed up on time. Dave grabbed the throttle and took McCallum for a run from Falmouth to Brooke, dropping a boxcar at Potomac Creek on the way. Then Scotty took the train back to Potomac Creek for a photo op. BG Kempinski lecturing on civil war railroads. Lee looks like he is zoned out in the foreground. Jamie Zepada photo used with permission. Alicia and I had a fun weekend at CSC11. We arrived a few hours late on Friday due to an accident involving a boat blocking all lanes of I-95. We avoided the accident but got caught up in the mess. We had enough time to eat dinner at the hotel and start my workshop on schedule. We had 12 students in the class. Several were able to finish the kit in the 3 hours we had allotted. Everyone seemed to enjoy the clinic and several folks picked up additional kits to build later. On Saturday morning, it was too cold for our planned cranberry bog hike, so I had a chance to meet the vendors and tour the layouts while AW headed to the outlet mall. There were two layouts set up, an On30 group called the Narragansett Bay Railway & Navigation Company and a HO modular layout called Valley HOTrak. Both were very well done. The On30 layout really shows off the advantages of the bigger scale. I had a great conversation with Andy Small of the NBRy&N. He has a small company called Train Troll that makes craftsman kits with a narrow gauge focus. He has several marine projects lined up for O scale including an ACW screw tug. I also got to meet Bob Van Gelder of South River Model Works, Brian & Jill Bollinger of BEST Models, Jimmy Simmons, Mike Willegal and many others for the first time. I met old friends including Craig Bisgeier, Jeff Adams, & Lee Weis. On Saturday afternoon I presented my talk on Introduction to the Railroads of the Civil War. It was very well received. I could see some light bulbs coming on as people realized the attraction of modeling this era. Scott Mason announced that this would be the last CSC. I'm glad I got to attend one before they ended. Alicia and I went on a purge after the flood, getting rid of many books, magazines, boxes and odds and ends that we just had hanging around. Most significantly, I gave away over 67 years of accumulated magazines. Marty got the complete CV HO Scale Coal Dock Diorama for use on his layout. JD and Brian got several of my N Scale structures that I have left over from other projects. I purged so much stuff that Alicia actually asked me if was clearing out stuff because I am terminally ill and not wanting to tell her. Not as far as I can tell - thank goodness. As part of this clean-out I decided to sell some of my oNeTRAK modules. These were my Afton modules set featured in Great Model Railroads last year and in N Scale Railroading on a couple occasions. The buyer lives near Chicago. He made arrangements for Bill Carl to haul them out for him during the Trainfest. I met Bill a few years ago when I photographed his club's, the Four County Society of Model Engineers (FCSME), modules for Kalmbach in 2004. Here Bill is inspecting the burned station at Falmouth. Being a retired Army veteran who served in Bosnia, he was particularly impressed with that. The FCSME have a bunch of extremely well done modules in HO scale. Here are some samples of their work. 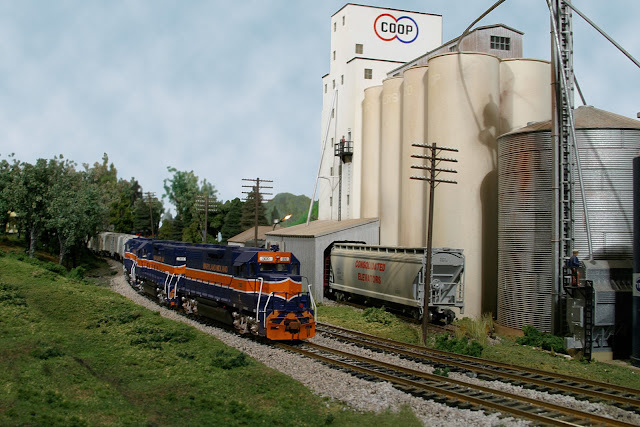 They frequently exhibit at Great Scale Model Trains Show in Timonium. Back on the Aquia Line, I took some photos of the smoke stack for the USS Passiac. I hope to get back working on the layout after CSC11. We leave in a few days for that show.